Chip and I just returned from a delightful visit to the completely refurbished Buckeystown Inn, now re-named Frederick Inn. The renovation was beautifully done, and I’ve got the Before & Afters to show you – plus the paint choices – which were spot on, and the inspired work of Tuscan Blue Design‘s Meredith Ericksen. The transformation was so complete, I’m showing it to you by floors. Your first look is at the first floor. 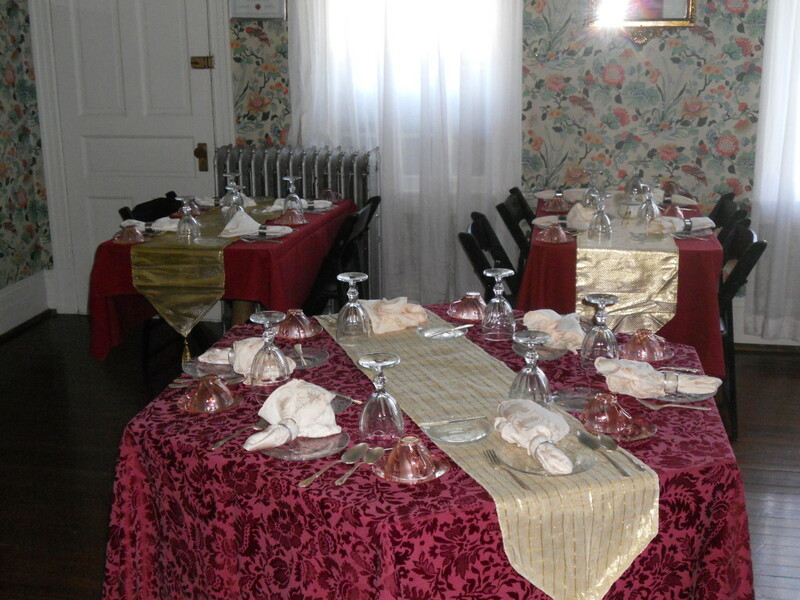 The wallpaper, red & gold table cloths, and view-blocking sheers combined to create a heavy appearance in this room. While I know a lot of designers go for it, I’m not a fan of dark ceilings (unless they’re used to make pipes, tubing, etc disappear in an industrial environment). In this potentially light space, the dark ceiling closes it in. Look for this stunning armoir in the before pictures of the guest rooms coming up in my next post. 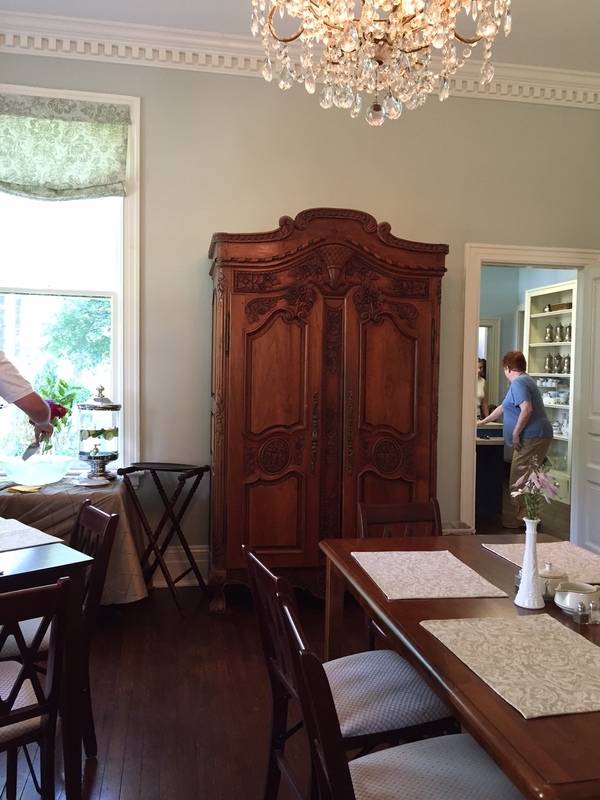 It was refurbished and re-envisioned as a linen closet. Perfect. 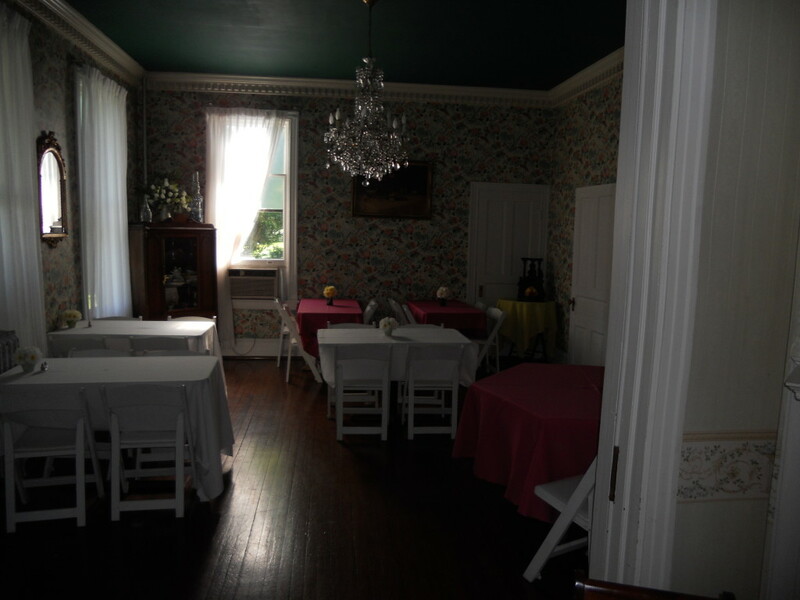 Also note how the valances soften the windows while leaving the view of the gardens in tact. Look at how the lightened walls and ceiling highlight the architecture and the stunning chandelier. Also, I actually loved that they left the paneling in the grand hall stairway its natural self. The contrast makes the painted walls all the prettier, and showcases the historic workmanship. 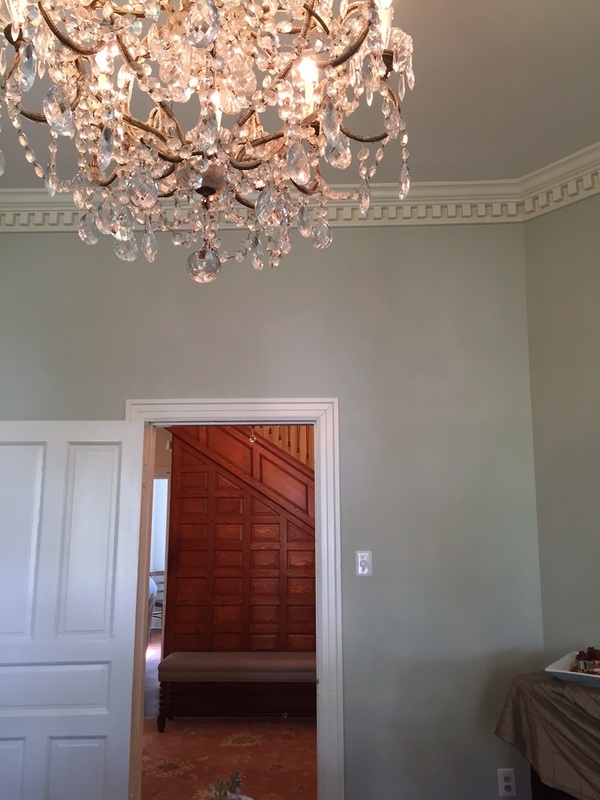 Wall color for the walls in this space is Benjamin Moore’s Silver Sage 506 in eggshell. Here again, the patterned wallpaper and rug, heavy furniture and busy table settings serve to close the room in on you. Simplicity of decor and soft color selections transform the space into a calm morning room. Wall color in this morning room is Benjamin Moore’s Beach Glass 1564 in eggshell. 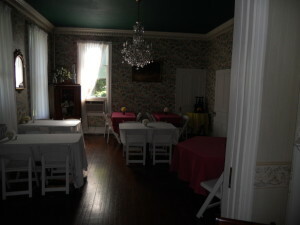 This photo is taken from across the hallway, looking through the front dining area into the sitting area. 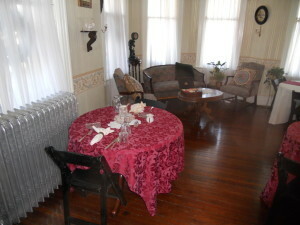 This view of the gracious seating area is a mirror image to the room across the hall (seen in the ‘before’ picture). Check out the stunning front door’s fan light window. 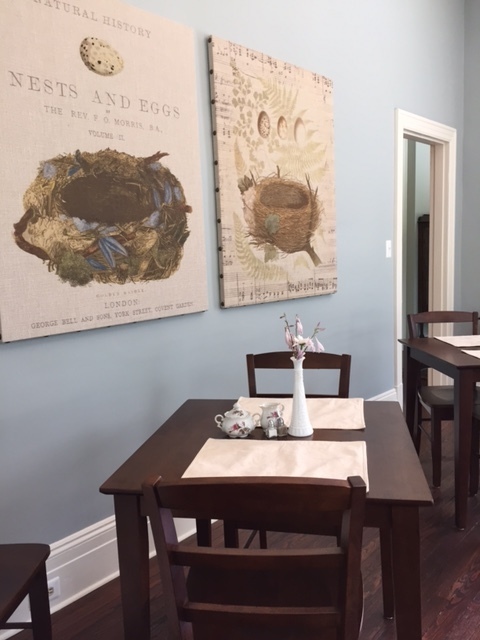 Wall color in the sitting area is Benjamin Moore’s Beach Glass 1564 in eggshell. Again, simplifying the decor, highlighting the architecture, light, and views has brought this space to life. 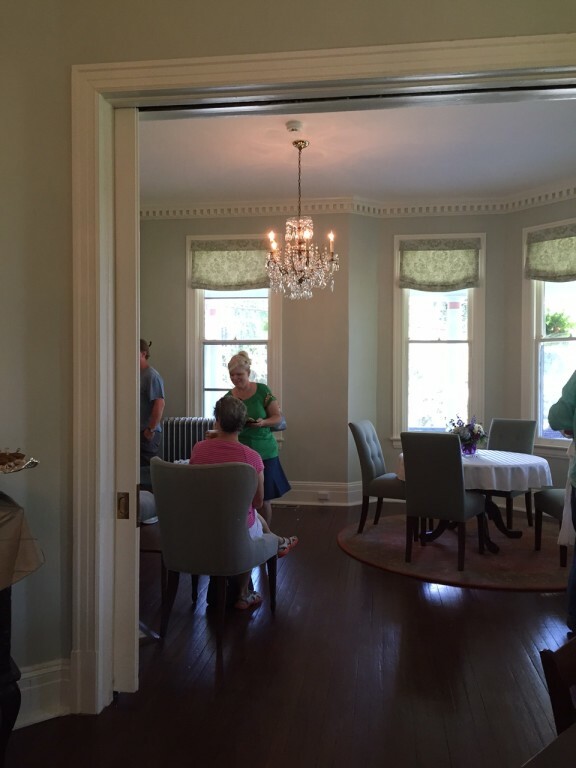 Wall color in this front dining area is Benjamin Moore’s Silver Sage 506 in eggshell. 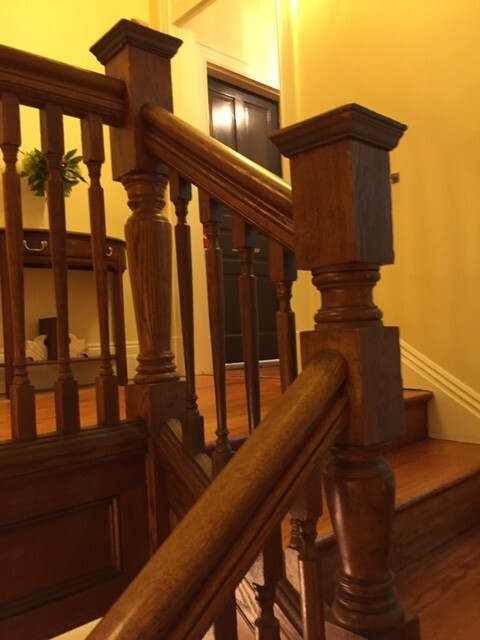 The halls were a soft, yellowy white (Benjamin Moore’s Hepplewhite Ivory, HC-36 in eggshell), which complemented the woodwork of the staircase. Just wait till you see how fabulous the pop of near-black on the hallway doors looks. That’s coming up next! Stay tuned. 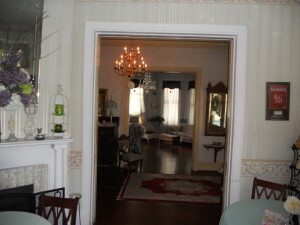 All first floor doors, trim, wainscoting, and fireplaces are painted Benjamin Moore’s Linen White 912 in semi-gloss. The ceilings are all done in the same color mixed at 1/2 tone in flat. 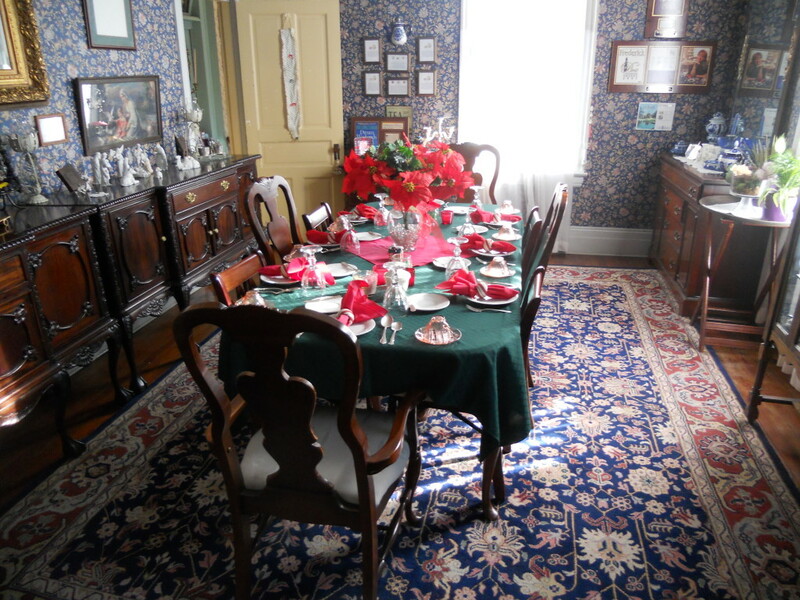 Want to see this fabulous inn in person? They do small weddings, events, and, of course, overnights. The Frederick Inn at Buckeystown. 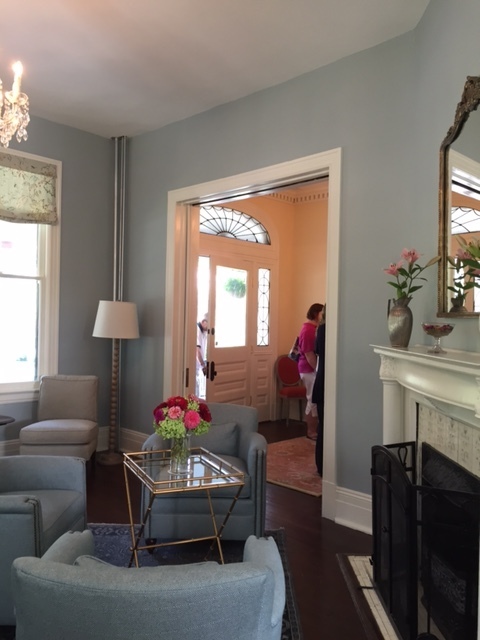 Hi Virginia – so glad you were able to attend the open house at the Frederick Inn last weekend! It’s great to know you love the design and transformation…it was a project done with loving care by all! I know the Hortsmans are looking forward to showing off their renovated 1897 gem and hope many folks come to enjoy the spaces. Such a beautiful job you did, Meredith! I’m so happy to see such an icon come back to life!